Service composition is one of the principles of service-oriented architecture; it enables reuse and allows developers to combine existing services in order to create new services that in turn can be part of another composition. Dynamic composition requires that service components are chosen from a set of services with equal or similar functionality at runtime and possibly automatically. The adoption of the REST services in the industry has led to a growing number of services of this type, many with similar functionality. 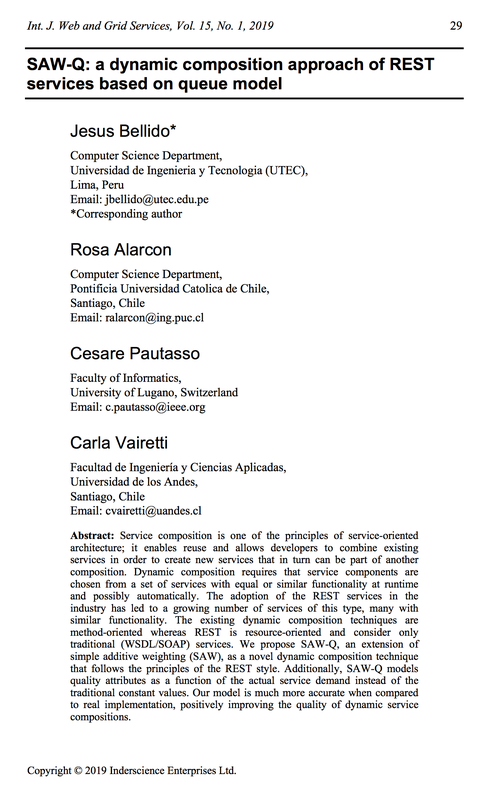 The existing dynamic composition techniques are method-oriented whereas REST is resource-oriented and consider only traditional (WSDL/SOAP) services. We propose SAW-Q, an extension of simple additive weighting (SAW), as a novel dynamic composition technique that follows the principles of the REST style. Additionally, SAW-Q models quality attributes as a function of the actual service demand instead of the traditional constant values. Our model is much more accurate when compared to real implementation, positively improving the quality of dynamic service compositions.